With my woodcut class done for a few weeks, I decided to take most of the class supplies back up to the Studio where I have places to store them. Putting them away only took a few minutes, leaving me time to work on something else. Today that turned out to be some framing. Last year, around the time of my niece Genevieve's baptism I decided to do a St Genevieve print as part of my ongoing saint series. And so I did, a nice colorful image of a well, finishing it last summer. I planned to frame one for her, and so when I put together my last art supply order, I included the frame parts for one of a nice size for the print. In recent weeks I looked into my supply of mat board and foamcore, and found that I had some pieces in my Studio almost exactly the size I needed. So today I set up my mat cutting machine and cut one of each board to the proper size, with a nice beveled window in the mat. I didn't have the actual print with me today, but I had other saints there I used to measure with. 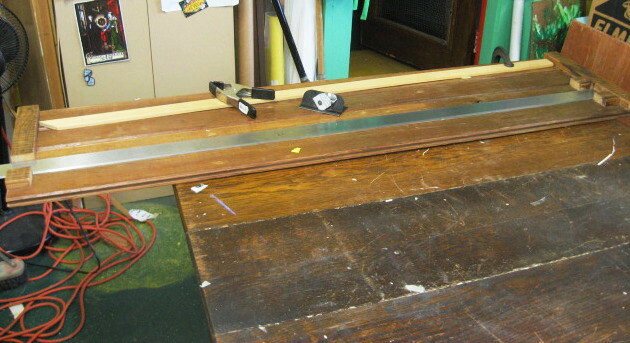 Besides, I don't have the glass yet, but once I pick up a piece I can put it all together in a few minutes. The delay won't be a problem- she is probably a few years away from even understanding the concept of what a well is, not to mention the story of the related miracle. Tonight was the last meeting of the latest woodcut series I've been teaching at the BAC. Two things made this night different from the previous three. One, this is the first Tuesday in a while with absolutely no rain, making all the various times loading and unloading the car worry free. (though with the current heat wave, some rain would have been welcomed this afternoon) Two, my two youngest students weren't there. (I had gotten an e-mail yesterday telling me about two last minute events that they had to attend) But that still left me with two students ready to work. Wynn's project has been a multiblock print, an image of a chair against a wall with a rug underneath. He was hoping to be able to pull a proof of the whole thing tonight, but he never got around to finishing the key block. Still, he saw it as a good opportunity to learn more about printing, so I got out the color inks and we made the above proof. (one thing he learned is that the quality of the ink makes a big difference in printing) He was pleased with how this first stage turned out, which will give him the incentive to finish the other block and put them together in the final piece. Mary brought back the block she's been working on over the past month. She had brought in a hand colored proof last week, and may experiment with color more later, but for tonight she was pulling proofs on a variety of papers. She liked what color can do, but also likes this image in black and white. She felt that the proof below wast the best one of the night, and I agreed. 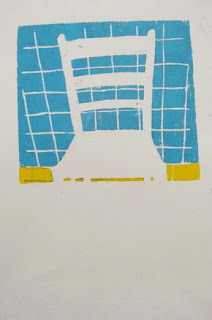 So, no woodcut class for a few weeks, but I'm planning to launch another series in mid to late July. Should have some returning students, and I hope a few new ones, too. Work resumed today on coloring this latest saint print. I made some minor adjustments to the hands, varying the color of each. The figures in the back have been the issue for weeks. Above is the latest version of what I might do. I don't know if this is the final combination, but I feel like this is getting close. I have one more copy which is identical except the whole background is uncolored. 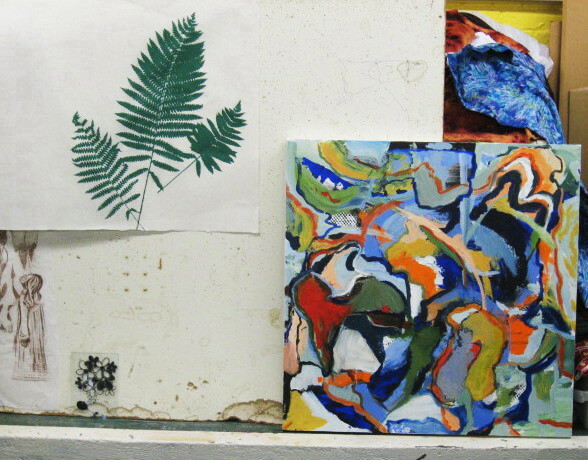 It should all be worked out in time for the next critique. 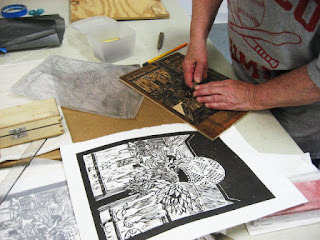 Time for week 3 of this latest four week woodcut workshop in Belmar. The first two Tuesdays included rain, and sure enough, a big rainstorm came across the state in time for this Tuesday afternoon. However, I had managed to load everything needed for the class early in the day, and by the start time of the class, we were back down to a mere sprinkle. No bridge delays this time, everyone was ready to work within a few minutes of the start of class. Mary was actually there early, so as soon as I opened up, she was ready to work. 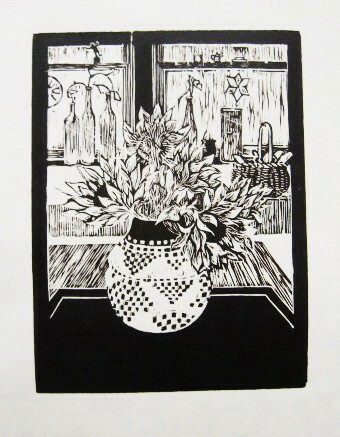 She had made a few modifications to her current block, a still life with a vase of flowers, and had experimented with hand coloring a few older proofs. In class tonight she pulled a few proofs of the latest version of her block (using her own can of burnt umber oil based ink), two of which can be seen above. I let her know that tomorrow is the one year anniversary of the first woodcut class that she ever took, so the current project is her last piece as a first year printmaking student. 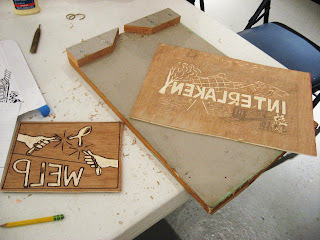 Wynn had his two blocks with him, and spent the time concentrating on the first block, the one that will be used to print at least two colors. In the above photo you can see the large pile of wood splinters by this block- the sign of a busy woodcutter. Below, siblings Erin and Brendan both made progress on their first ever blocks. Each probably has about an hour's worth of work to go, so I expect both will be ready to print before the end of next week's class. 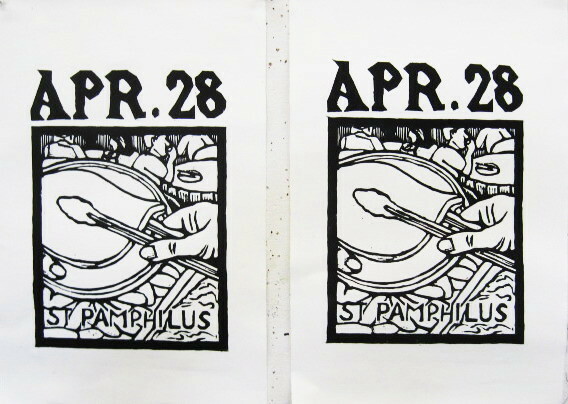 Should be a very busy night for next week's concluding woodcut class. Some cutting, and a lot of printing will be going on. Maybe it will be a dry night. Tune in next week and see. I dropped by the Studio this morning to pick up an old block that will help me demonstrate something in tomorrow's woodcut class. As long as I was there and I had a little time, I figured I may as well continue the coloring. Still mostly sticking with established colors from my prototype, so that meant the gray metal stuff, along with adding another layer of color to hands, sausages, and eggs. I started playing around with colors for the background, testing a few in the upper left corner, before coming to the conclusion that I should look at my sources for those figures one more time. 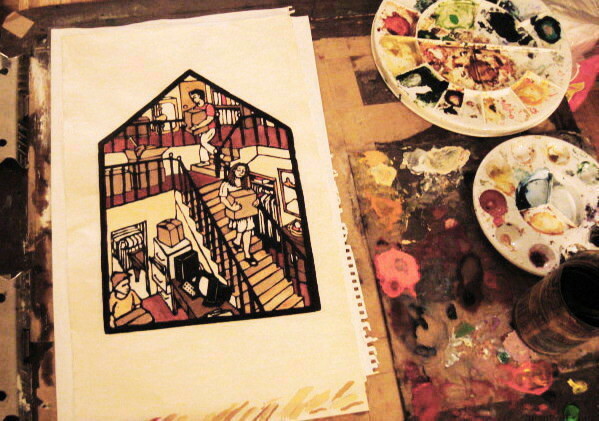 Back home I found those sketches, and I'll try to have a plan before the next time I sit down with my watercolors. Had time today to get back to the current print. 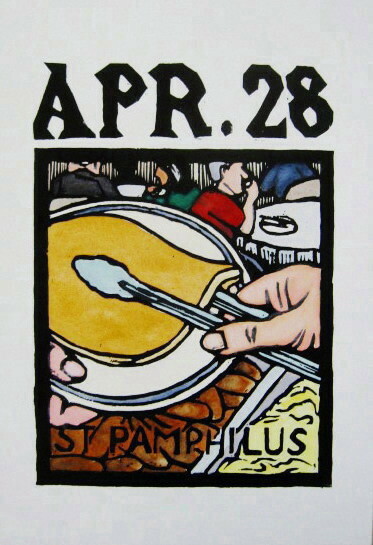 Today I colored the things I was sure of, all based on my original color proof- pancake, hands, sausages, eggs, plate. It goes fast when you know exactly what you are doing. I know exactly how the metal bits (tongs, steam trays) will be as well, but sometimes its better to wait and let the whole thing dry before continuing. No harm if this has to wait until next week to be finished. On the way home I stopped at the Boatworks to see if it wasn't too early to pick up my pieces from the Art on the Edge show, scheduled to end today. It wasn't. I figured it would be better to take my pieces right off the wall and put them in my car, rather than take a chance that they'd be moved to a stack against the wall and the risk of getting wet if some more water seeped into the building overnight. Lost too much art to flooding last year to go through that again. The pieces are now safe at home, but I'll be back tomorrow to document and help with some plantings around the building. Again we had major rainstorms sweeping through the state today, but luckily the very worst weather went well to the north or to the south. Around here, about an hour of heavy rain and distant thunder, and then it moved on. 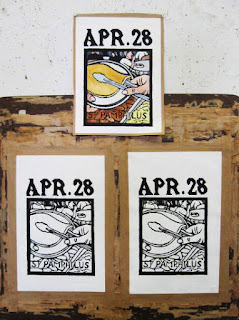 With the threat of rain and local flooding gone, I could safely transport my first proof of St Pamphilus, still taped to a drawing board, back to the Studio. Once there I cut it off the board, pulled off some loose tape, and taped the two recently printed proofs to the board. I considered bringing them and my paints home to work on overnight, but there's no hurry on this. I'll likely go in for a while tomorrow. After a week off, we were ready to resume the latest round of woodcut classes. I sent out reminders last night and had my car loaded with everything. There was a threat of a rainstorm for about the time I'd be having to move all the supplies into the building (just like our first meeting two weeks ago), but other than about 2 minutes of afternoon sprinkles, it ended up being a very nice day. We needed that, as another major storm had passed through the area yesterday, leading to another round of local flooding. I was able to bring in all the class supplies with ease, but the storm had its effect on us. The excessive rain over the past few days had caused some minor flooding inside the the Boatworks, leaving a few small puddles and a discolored floor that will eventually need repainting, but class would go on. 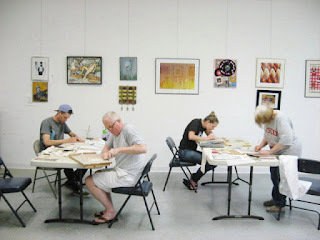 At the official start of class I only had one student, my most veteran woodcutter Mary, who had been busy with the new block that she had shared with last week's critique group. She showed me a bunch of proofs she had pulled, and told me about her plans to finish it. I made a few suggestions, including taking a rubbing off the block to help evaluate possibilities to change. Later she would go back in and started making some of those changes. About 15 minutes into our class period the other three students came through the door. It seems that they had all been trapped on the north side of the Shark River inlet by raised drawbridges, a potential hazard this time of year. I recommended going with route 35 next week and got them started. 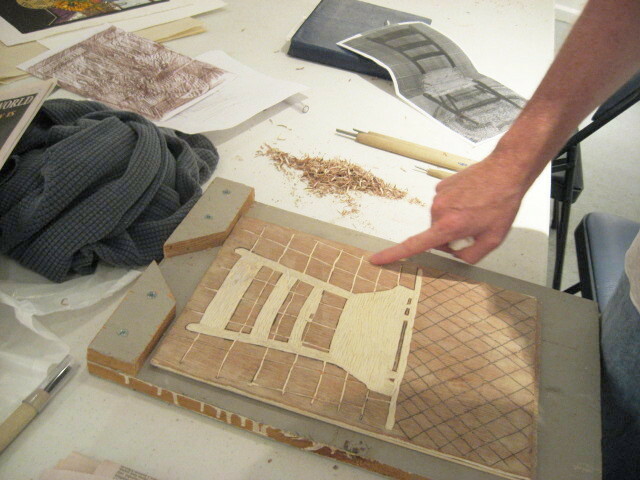 Wynn (who had brought in one of the reductive prints he had been experimenting with on his own) had two blocks drawn and a good idea of how he wanted to proceed, so I showed him the tools we had to work with, gave him some basic instructions, and got him started. 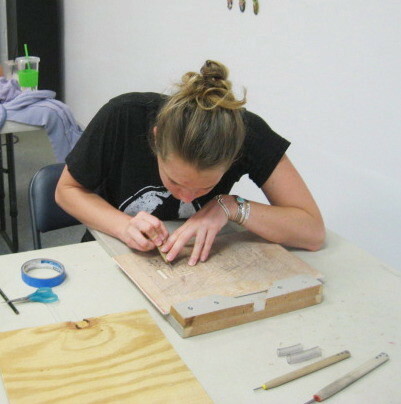 Erin brought in a sketch on paper, but wanted a larger piece of wood to use for the print, so I cut her one and let her prepare it. I had made a few suggestions regarding her sketch, which she considered as she reproduced her idea in reverse on her block. Eventually I also gave her some basic tool lessons and she started cutting her block. Brendan had rejected whatever paper sketch he had done since last time, but had an idea, and spent the whole time working out his idea on paper, then reproducing in in pencil on the wood. He'll be ready to start cutting next week, and his block is small enough that he should still be ready to print by our last class meeting. Here on the Jersey Shore we are a bit sensitive on the topic of hurricanes, having been through two of them the past two years, with last year's one of the worst in history. So naturally we all noted with mild concern that hurricane season officially began a week ago, and we started paying attention when the first named storm of the season (Andrea) popped up just a few days later. This one started in the gulf, cut up into Florida and up over the Carolinas. Only a tropical storm, and all storms from sea lose power over land. Plus hurricanes and tropical storms are fed by warm ocean water, and this time of year the water is still a bit chilly in New Jersey. Its track took it out to see over the Delmarva, but even a near miss from a lesser storm brings a ton of rain, which resulted in a bit of local flooding last night, but no real damage around our area. However I still had reason to be concerned. The central part of the state is miles of hills and valleys, carrying many rivers and tributaries, and it doesn't take much rain to create flooding. Expectation for that part of the state were 4" to 6" for yesterday afternoon, evening, and overnight, and the Printmaking Center of New Jersey sits right in the middle of all that. So when I got up this morning I didn't know if today's planned reception would happen. Checked the traffic channel on cable and there was only one reported road closing in that area, not affecting my route. Tried calling, but no one had arrived yet to open up. No e-mails announcing a postponement (geography of that area being what it is, we have gotten them under certain circumstances), so I decided to go ahead and drive up there. Got there just at noon, the scheduled start time for the event, and even was able to grab a spot on the main paved parking lot. The first hour was the Annual Member Meeting, a discussion of finances and business. Reports say that business is good- programs are successful and bringing in even more revenue than projected. There were presentations about some upcoming events and programs, as well as long range plans. Then it was time for the reception. This is our 40th Anniversary Members show, containing 60 works from 45 members, plus 3 pieces from juror Eileen Foti. The last show I was in at this location was the 36th Annual Member show in 2011. If you feel that math makes no sense, you're right, but after some thought I figured it out. For most of our history we had an annual show, number to match the number of years that the organization existed. However, a few times in my years there we didn't have an annual members show, but the numbering system was continued from whatever the previous one had been, so by 2011 PCNJ had existed for 38 years, but had only 36 member shows. I was rejected from last year's (37th) and the current show's designation of 40th is not about the number of these shows we've had, but reflecting the anniversary of the founding of the organization. The 63 pieces were spread out over the main gallery and the library gallery. 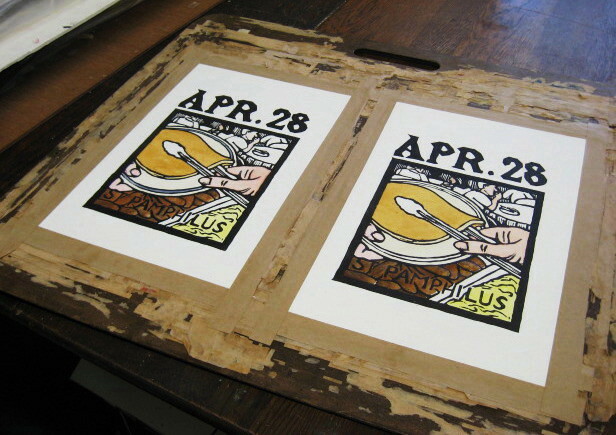 Of those, there were 11 pieces of relief printing, wood and linoleum, and these were often hung near each other. 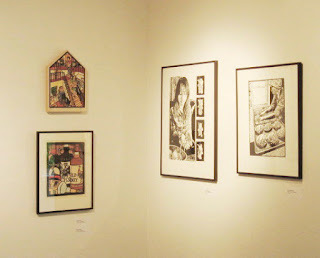 The top photo shows a corner with my two hand colored woodcuts, and two nice black and white linocuts from Lizz deSimone. The photo below shows the opposite wall. 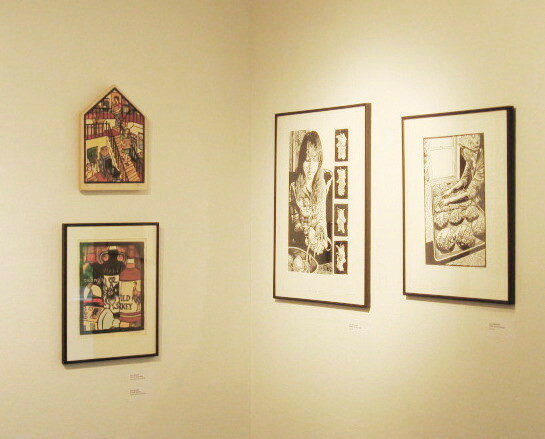 The two stacked prints on the far left are woodcuts from Mark Estes, who took a class from me at PCNJ many years ago. 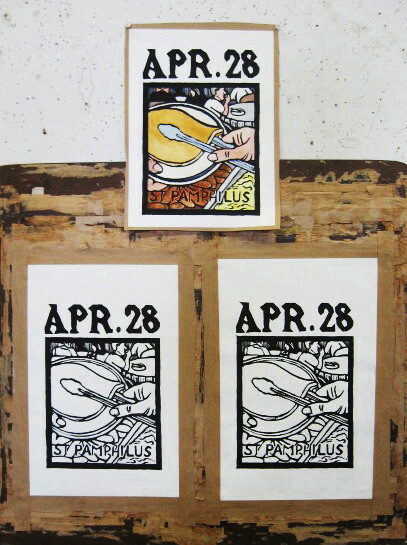 The pair of woodcuts to the far right are from Bob Craig, who I believe also took one of my classes years ago. As usual, a lot of activity ends up taking place in the studio, where we had set up the pot luck food. 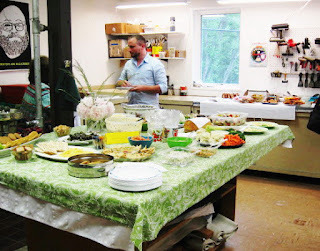 Plenty of stuff to pick from, so everyone got their fill and munched and snacked through the afternoon. We had a good crowd overall, so we always had plenty of people upstairs with the art and downstairs with the food. Had a chance to talk to many friends and acquaintances that I hadn't seen for at least a couple of years, which I enjoyed. 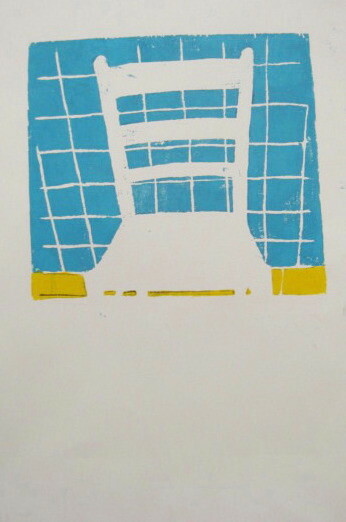 A lot of people singled out my house print as a favorite- its unusual shape really stands out. The show remains on display during regular gallery hours through August 10, 2013. Admission is free. See the main website for more details. Went into the Studio for a few hours today to take care of a few tasks. The biggest one was pulling two proofs of my re-cut St Pamphilus block. Changes include a little bit of cleaning up lines here and there, but the big difference is that I cut out the clothing of the two figures in the upper left corner. I haven't yet chosen the colors I'll use in that section, but it shouldn't be too hard to balance things up there, while still keeping things back from the stuff in the foreground. I pulled two proofs, so even if I don't get the colors right the first time, I have one more copy to use to make a final version of the print. 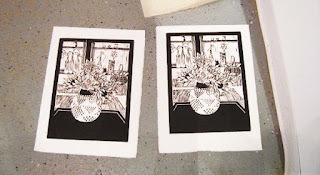 I left them there to dry, and will get back to the coloring next week. Today was the deadline to deliver my pieces to the show up at the Printmaking Center of New Jersey, in what they are now calling Branchburg. (the town has had a few other names for mailing purposes over the years) Things were a little chaotic when I arrived, as they were giving the gallery a new paint job before hanging this show. Being that my trip would get me there for early afternoon, I had brought my lunch along, and decided to enjoy it outside at the picnic table. It turned out I had plenty of company out there- our director and several interns. In fact, the PCNJ is going to have 7 college interns working this summer. I don't remember ever seeing more than one around there at any one time. With this much help, maybe they can add an extra story onto our building before September. School is over for the next few months, which frees up my Mondays again. So not only are we able to move our group back to the traditional Monday, we are even getting it in on the first one of the month, as was our tradition. Not a huge crowd tonight, but more than enough people to have a fun evening. With school over, a lot of the other activities around out building are also done for the season. 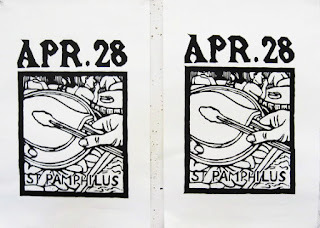 (last month there were a few hundred people in the building, this time there was only one other person in the building when we started) I showed up about an hour before to take care of a few things, including making some planned additional cuts on my St Pamphilus block. I forgot to get a photo of the altered block, but I'll show it in a few days when I proof the block again. 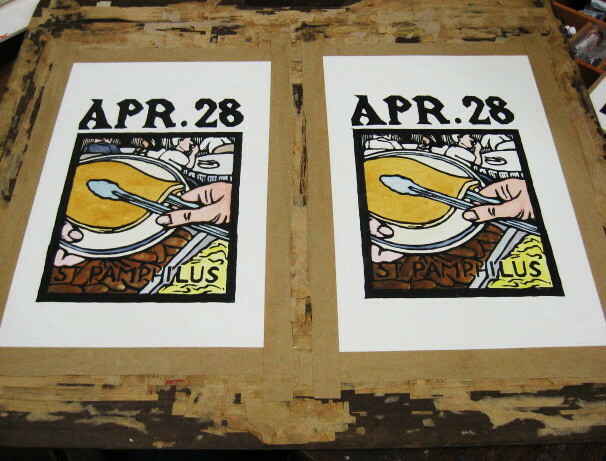 Molly arrived early herself, giving her time to do a little cleaning and pull a proof off one of her new silkscreens. You can see it above, the large green fern. This and other similar plant prints will be paired with giant woodcut heads she started during the spring. The small glass plate below it is also Molly's, and a screen made from that provided the design for a t-shirt example for one of her school groups. The large colorful piece next to it is from Edy, back from an extended stay out of state. This is the most abstract thing she's every brought us. 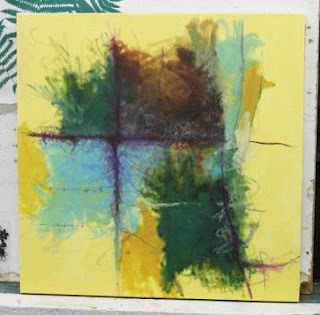 Above is a painting from Vince from his ever evolving grid series, some of which he showed last time. This one is less chaotic than the last batch, and barely a grid- more just colors arranged around a pair of crossed lines. What I liked about this piece was that the colors had almost a nature feel, and he admitted this was the first time he used green in this series. Below are two abstractions from Sheilagh, more of her acrylics with many layers of texture. 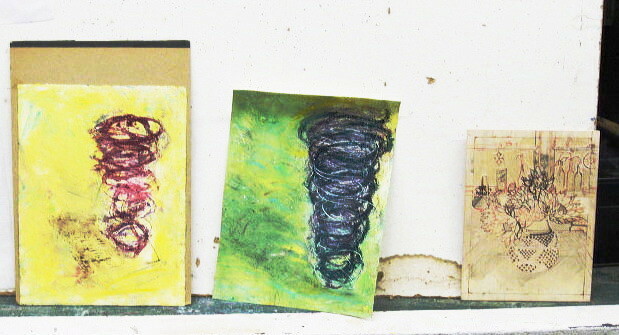 The tornado shapes were done before the rounds of storms that have hit Oklahoma hard the past few weeks. Also shown below it a block in progress from Mary. It's her first still life since starting woodcut, and not a typical subject for her, but she feels it will be a good subject for some experiments in reduction printing. Since she'll be doing that as part of my class in Belmar, I'll post the results as I see them. Also present tonight was Harriet, with her ongoing sketchbook series, which I didn't get photos of. My contribution tonight was the colored version of my St Pamphilus print, which they saw as just a black and white proof last month. Everyone felt that the colors did make the subject a lot clearer than the black and white version. (I saw it clearly all along, but I knew what the colors would be) I also passed around the block, so everyone could get a preview of the changes. It should all be done by our next meeting. 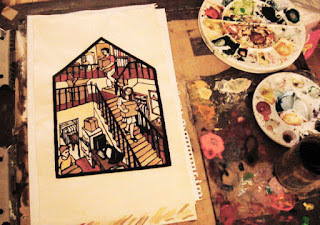 I had brought a few things home to work on, and this evening I continued the coloring of the latest copy of the house print. Completed the browns and the reds, leaving just the blues and greens and a few little bits of colors left. Should be no problem finishing those during the day tomorrow, so I'll have a completed copy of the print before I turn my mounted version into the PCNJ show in a couple of days.